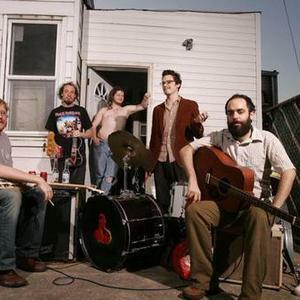 Originally formed in 2003 while the members attended SUNY Purchase, the band played a series of shows at the now defunct Apocalypse Lounge in NYC, and quickly began building a fanbase with their reverently twisted take on Americana filtered through a wealth of musical influences as divergent as Bill Monroe, Prince, Neil Young, The Microphones, and The Misfits. For these shows, O'Death put together a very raw, 10-track CD-R, entitled Carl Nemelka Family Photographs, to sell to concert-goers. As O'Death worked on new material for their second, self-released LP, Head Home, the five-piece perfected their stage show. The band's nonstop touring caught the attention of the New York-based Ernest Jenning Record Co., who re-released Head Home in June 2007. Later that Summer, UK-based label City Slang released Head Home in Europe. O'Death continued to tour the US and Europe throughout 2007, putting out a limited edition (500 copies) vinyl version of Head Home on Ernest Jenning Record Co./City Slang, followed by a 7? single of two new songs, "Low Tide" and "I Think I'm Fine," as well as a cover of The Pixies' ?Nimrod's Son? as an internet bonus track. Head Home was nominated for a 2007 Shortlist Prize. On February 5, 2008, Gigantic Music released a new 7?, which features songs ?Spider Home? and ?Silk Hole?. The band also participated on Vincent Moon's The Take-Away Shows.